Only one Australian designed aero engine has ever achieved mass production and commercial success, Jabiru engines having now been in continuous production for more than quarter of a century (and sold to more than thirty-one countries). During the Second World War Australian industry proved itself well capable of mass producing aero engines, vast numbers of imported designs (viz. Rolls Royce, Pratt & Whitney and DeHavilland) having been produced locally for the war effort. Although we possessed back then both the manufacturing capability and expertise needed to design and produce our own engines, the vast wartime surpluses ensured this never occurred. In the early 1950s the Commonwealth Aircraft Corporation did make a foray in this direction with its locally designed and built R975 Cicada radial engine, intended to power the RAAF’s new CA-25 Winjeel trainer. Only two Cicadas were ever produced however before project funding was withdrawn in late 1953, the project having being overtaken by the ready supply of [comparatively] cheap – locally manufactured – P&W R-985 Wasp Junior engines. Although it never went into quantity production, the Cicada was nonetheless the first locally-designed aero engine developed with that end in mind. This significance would have been easily discovered – if not known – back in 1959 when the Museum of Victoria was offered (gratis) a Cicada. 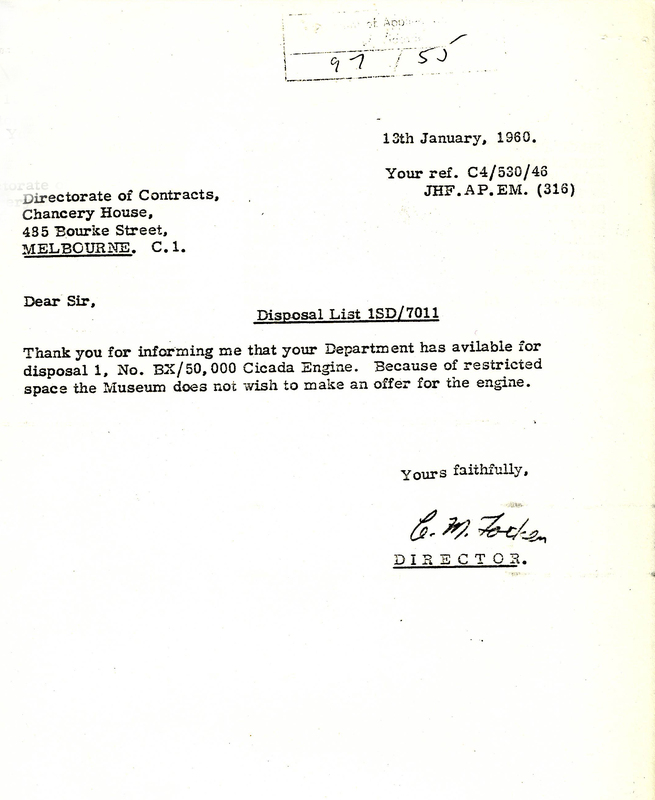 And yet, despite this significance and its association with the Commonwealth Aircraft Corporation (still one of Melbourne’s leading manufacturers at that time), the Museum’s Director declined the offer because of “restricted space”. While the Museum’s response might appear short-sighted and irresponsible at this distance, it needs to be borne in mind that the state collections were, at that time, still housed in the same CBD premises which they’d first occupied in the late nineteenth century. Space would certainly have been at a premium and yet, somehow, the Museum managed to find sufficient display space for a Wirraway aircraft when presented with a similar offer, just six years later. Nothing now survives of the Cicada.